The Finnishness of 1848  does it need "rebranding"? The 150th anniversary of the Finnish national anthem, Maamme, was celebrated on 13 May with a concert by 800 singers on Kumpula Meadows in Helsinki  where it was first performed. 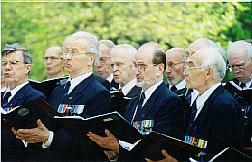 Celebrations were also held in Londons Hyde Park where the Helsinki War Veterans Choir performed the anthem and other Finnish patriotic songs. The theme was continued after the concert at the Royal College of Art where Professor Johan Wrede from the University of Helsinki opened a discussion on 1848 Revisited: Another Singing Revolution? In telling the story about our people becoming aware and even proud of being Finns, the national anthem played its role. Knowing that it was originally written in Swedish (Vårt land) and knowing the need for Finnish patriots to prove cultural independence in relation to its former mother country, Sweden, it is amazing how immediately the song -- in the Finnish translation as well as in the original Swedish version -- was accepted as an anthem, thus negating the Hegelian principle that if there is a nation it has to be created upon one language. There were attempts in the 1880s and again in 1920s to replace it. One reason why it was accepted is that the lyrics by Johan Ludvig Runeberg are not bad and neither is the music by Fredrik Pacius. The poem is a piece of creative writing that is open to different interpretations. As we know, the first performance of the anthem was the Finnish contribution to the revolutionary year of 1848. At that time there were two kinds of anthems  the dynastic type (God Save the King) or revolutionary (Marseillaise). According to Johan Wrede, both these characteristics are absent in Maamme. It is a peculiar anthem. Not even God is mentioned in it. Wrede regards the anthem as part of an emancipatory mobilisation against Russia, even in military terms. Runeberg achieves this by using descriptions of nature and historical images of past wars. 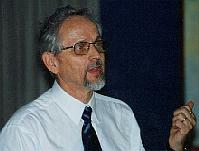 Professor Matti Klinge thinks that Runebergs political intentions were of a different kind. The anthem deliberately avoided any hints at social radicalism. It has nothing in common with the Marseillaise, despite the musics brisk marching style with a strong emphasis on the first tone of the song. The Finns had to be the best pupils in the class. The anthem was an anti-Marseillaise to show that Finnnish patriotism did not contradict loyalism to the tsar. No doubt, this was the strategy by which means the Grand Duchy strengthened its position during the last century. The anthem does fit into this pattern. Perhaps the ambiguity of the anthem contributed to the successful "branding" of Finland in 1848. It satisfied the bureaucracy as well as the young radical students: A young and impatient audience with deep national and emancipatory needs felt happy with it in a way that did not leave much space for any alternative civic culture. Deep contradictions emerged later in Finnish society, but the anthem remained the common capital to be claimed by different segments of the nation. This is all very much history! How adequate and relevant is the anthem in the Finnish society today? Is the characterisation of Finland still valid? The natural environment is still there, still financially and psychologically important. The history is there; since 1848 there have been more wars. But there are limits to new interpretations of the anthem. Runeberg wrote for instance: "Our land is poor; true, we reply,/ For him who covets gold". This sentiment is not true. In 1848 there was -- and there still is -- a need for a symbol by which one can declare where one belongs. Runeberg responded to this need by defining Finnishness. And astonishingly enough, as the anthem is a story about how it all began, I think it probably is the best possible symbol also for today. For the sake of argument, would it not be a challenge to write an anthem for the next millennium, an anthem which would reflect images of Finland of today? One could organise competitions and vote for the song we like best. We can even vote for the song we think expresses Finnishness best. But the problem is that the symbol for Finnishness must be something else than a definition of Finnishness. Because it is a completely unmodern thought to imagine that there could be a consensus on what Finnishness is. Only by totalitarian methods can such a consensus be achieved. For sure, talk of "branding" is more post-modern. We are aware that branding is something superficial, a PR method for achieving certain concrete, economic objectives. This editorial would not have been written without the debate on rebranding Britain, so I would like to comment on that debate. Will Hutton says that "rebranding is on to something" and that "the politicians are ahead of the intellectuals" in this matter (Observer, April 5,1998). I cannot judge who is ahead of whom. But I do think that rebranding in Blairite terms is a tricky hybrid and an intellectually challenging issue. On the one hand it looks like a simple matter of marketing, a way of creating images of Britain for external use in order to sell British products on an international market. This makes sense especially when the images are attractive: new democratic structures at local and central level, entrenchment of human rights, an expanding industry at the soft, creative and networking end of the economic spectrum. Rebranding in this sense raises awareness and places an emphasis on marketing nice new policies. On the other hand it looks like an anachronistic effort to decide from above the essence of Britishness -- even if it is obvious that the focus is on only some specific sections of society. The implication is that sections outside the focus ("stately homes, sleepy villages and grimy industrial towns", to use Hutton's summary) are not good images of Britishness. This kind of selection is certainly not ideologically neutral. But what is even more important, this grading of better/more British or worse/less British can hardly be called multiculturalism. It is reminiscent of a physiocratic-like analysis about good and bad sections of society.